Unrest was not the only server affected. It turns out that the server maintenance that occurred this week for Butcherblock, Everfrost, Freeport, Nagafen, and Unrest removed all scheduled activations and deactivations. Erollisi Day now concludes on 2/20/15 at 11:59pm Pac. Moonlight Enchantments began on 2/20/15 at 9:45am and will last through 2/22/15 at 11:59pm Pac. The Norrathian Chronicles Launches with Erollisi Day! I’m proud to announce that a fellow player who I have twice met at SOE Live and then had the fortune of spending New Year’s Eve with is embarking on a new adventure in broadcasting with his own EverQuest II-themed weekly show! Oakmiser‘s new channel, which he calls The Norrathian Chronicles, will see 5-15 minute videos covering news, live events, content updates, and tutorials for in-game topics that tend to trip players up. He’s already listed a few of the subjects of his upcoming programs including: Experimenting Guide, Altar of Malice Review, Timed Mission Tutorials, Advanced Solo Tutorials, Housing Guide, and so much more! New Video(s) will post every Friday starting next Friday the 13th! He asks that those interested in his videos like, subscribe, and follow @NorrathianChron on Twitter, NorrathianChronicles on Facebook, and his Youtube channel. Flowers are blooming and love is in the air once again. Erollisi Day might have originated with the Sentries of Erollisi, faithful devotees to The Goddess of Love, but it’s blossomed into a holiday that’s celebrated by Norrathians across the lands! Whether you are a hopeless romantic or a love cynic, this holiday has events you’re sure to enjoy. Take a look at all of the exciting events taking place this Erollisi Day! My first in-game experience with an EQ2 Guide took place early in my playing career in Kelethin. A particularly threadbare patron was in need of crafted clothes, so I (and more than a few others players) sprang into action and crafted an appropriate garment. In return, I was given a robe with a unique pumpkin orange and black appearance which was only available through the quest. I wore it for quite a while, not as a fashion statement, but because I thought player-run events like this were cool and memorable. Remember too that this was back when there weren’t nearly the wide selection of armor appearances there are today. Fast forward and while Guide quests are often known for “milk and cookies”, there are other rewards and more elaborate quests out there. The most elaborate being the recently added Nebulous Newsies quest which awards some 5 million status and a unique 66 slot bag! When a Guide signs in to offer this quest (in Cardin Ward of Obol Plains), it is almost as talked about in public chat channels as Public Quests were in the day! So how do you know when a Guide quest will be happening next? Well there isn’t an official calendar (I’ve asked!) but there are Guide update threads for each EQ2 server where members of the Guide program announce their upcoming engagements. On Test: Erollisi Day 2015 and Agnostic Dungeons Up To Level 94! Currently on Test is the popular Erollisi Day event, as well as an upgrade for the popular Level Agnostic Dungeons. First up, Erollisi Day returns with new 3 quests, a new recipe book, new items, and rewards. We understand that EQ2 ZAM and EQ2Traders are already working on updating their event guides. As for Level Agnostic Dungeons, which have quickly become an enjoyable and rewarding way to gain levels between 20 and 89 in between solo questing sessions, we’ll see a number of fixes to particularly tricky zones and unbalanced situations, and an overall upgrade that opens up the feature to level 94. This leaves Skyshrine for level 95 grinding, Brokenskull Bay for level 96-100 grinding, or for those with the gear, High Keep Contested. If you need a laugh, then I encourage you to read the particularly hilarious Test Update Notes: Friday, January 23, 2015. Yes, we’re pretty late on this news — sorry! Are you still working on leveling an army of characters to 100? Want to see that XP bar move a little quicker? Well, we’ve got some great news! We’re starting the New Year off right with a BIG bonus experience weekend! What’s better than a 100% (double) bonus XP weekend? That’s right, a 150% bonusXP weekend! Beginning Friday, Jan 9 at 12:00(noon) PST until Sunday, Jan. 11 at 11:59pm PST, All Access Members will receive 150% bonus Adventure and Tradeskill experience! What characters will you level this weekend? We’d love to see some images from your adventures around Norrath, so please share them with us on our forums, or on ourFacebook or Twitter pages! Do you want to take advantage of this big bonus XP weekend? Become a Member now! Are there some status items you’d love to purchase this season, but your personal status points are running a little low? Would you love to make a charitable donation to your guild hall escrow account this holiday? There’s a lot to celebrate this Frostfell, and we’re happy to announce the chance to earn some extra status this season! Beginning today, December 17th, at 12:00pm (Noon) PST until Sunday, December 28 at 11:59pm PST, All Access Members will earn double personal status. This holiday is too special to celebrate for just one day, so we’re celebrating the season for 12 Days! Frostfell 2014 is Now Open! Each year, Frostfell gets even bigger with more quests, more collections, and more recipes with more items you can make for your home. It’s hard not to miss something without a writeup or two and fortunately EQ2 ZAM and EQ2Traders continue to deliver. Meanwhile Lera has fully updated EQ2Furniture to include multiple screenshots of every single house item available in EQ2, including all the new goodies for Frostfell! As of Noon pacific, Frostfell is open for business, and the remaining few EQ2 fan sites are all over this much-anticipated event. UPDATE: Frostfell went live at 12:00 noon Pacific Standard time. There’s a lot of excitement happening here at SOE. In addition to news and updates about our games, we want to make sure you have the chance to participate in some of the great promotions we have to offer! This holiday season, one promotion is available through e-mails only. If you want to have the chance to participate, you need to make sure you’re “opted-in” (signed up to receive e-mails from Sony Online Entertainment)! In order to receive our holiday promotion e-mails, you must have this box checked on your account e-mail preferences by Wednesday, December 17, 2014. The weather outside might be frightful, but the Norrathian streets are decorated and the citizens are so delightful! The Gigglegibber goblins and Frostfell elves are spreading cheer throughout Norrath this season and encouraging players to visit the Frostfell Wonderland Village. You can access the Wonderland through the Magic Closets in Qeynos Province District, Freeport, Haven, Kelethin, Neriak, Gorowyn and New Halas. In addition to the return of your favorite Frostell festivities, you can also look forward to plenty of exciting new content this season! Frostfell is now active on Test! There’s plenty of Frostfell cheer throughout Norrath this season! Gigglegibbers and Frostfell elves are busy celebrating the holiday within the player cities, and encouraging everyone to visit the Frostfell Wonderland Village, accessed through the Magic Closets in Qeynos Province District, Freeport, Haven, Kelethin, Neriak, Gorowyn and New Halas. There you can assist Frestishan, Candice Cheriweth, Gardy Ex-Giftgiver, Mr. McScroogle, Queen Bunny, and Snarf Frostfoot with some holiday tasks, but only after you release them from their deep freeze! For those that have a talent for crafting, you can help Sogs Frostfoot, or gather presents to craft wondrous new Frostfell goodies for yourself. Don’t forget to log in each day and claim your extra-special Frostfell present from everyone’s favorite Frostfell Gigglegibber, Santa Glug! Every player has a unique experience, story, and point of view, especially when it comes to games. The types of players who create streams, videos, articles, memes, and more share a deeper, richer story with their communities. 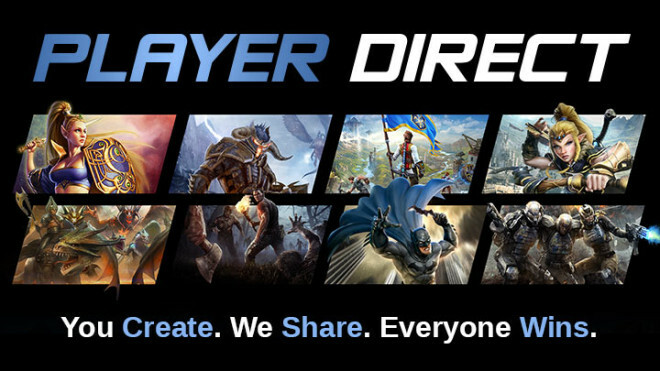 That is the heart of our newly expanded Player Direct program. Tune in to watch Holly “Windstalker” Longdale, Kyle “Kander” Vallee, and Ry “Roshen” Schueller as they show off the newest expansion Altar of Malice, and play the new Aerakyn race. The team will also be running a special 10th Anniversary in-game event on the Freeport server that you certainly wouldn’t want to miss! Do you like giveaways? We got them! During this one hour stream there will be goodies that some of our luckiest viewers will pick up as part of the 10th Anniversary celebration. You DON’T want to miss this stream! Will we see you in-game or in Twitch chat? At SOE Live this year, we found out that of all the internal test servers that the EQ2 team uses to build content, none of them behaves quite like the Live or production servers. 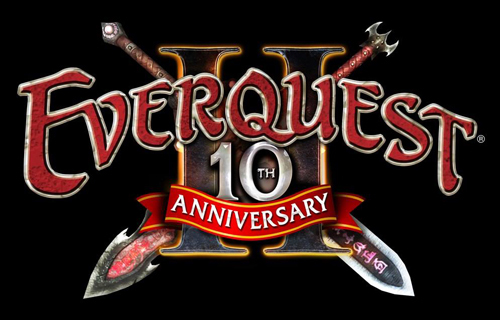 EverQuest II’s 10th annivesary is being celebrated with the return of the Heroes’ Festival event and although we understand the event was extensively tested internally, things just did not work as planned when the event was pushed to the live servers. 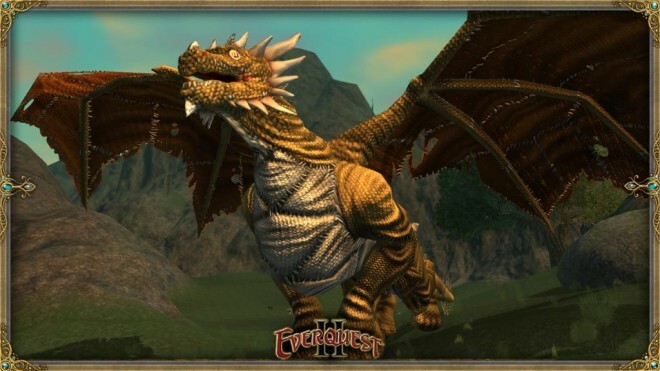 To force the event to run properly, members of the EQ2 team and Customer Service have been empowered to manually start up these events and spawn the vendor Roslyn through the weekend until a proper fix can be rolled out on Tuesday. So far these puppet/patchwork events have been a lot of fun and received positive feedback. Even though they are raid mobs, in actual practice they work like Public Quests in that anyone of any level can participate in the fight. As long as you get the buff on you from fighting them (you need to stand rather close to them), you should get credit. Don’t worry, they don’t actually do any damage. There are zonewide notifications several minutes before they spawn. Specific details of the event can be found on EQ2 ZAM. Note that if you are a low level character, you can still reach Baelon in the Eidolon Jungle. Travel to the Feerrott and then take the nearest teleporter to the Fearcreep. Tomorrow marks the 10th anniversary of the release of EverQuest II. To celebrate this, the annual Heroes’ Festival returns with some new events, specifically five open raid encounters which anyone can participate in and earn credit (like a Public Quest, you do not need to be grouped or even the right level to get credit). UPDATE: The Heroes Festival did not appear on Test or Beta, and so players are reporting a number of issues, specifically that the camps have despawned and vendors are unavailable. UPDATE #2: According to a dev update, the mobs have been respawned, but there is no assurance that the quest will keep running all weekend. View the “The Play’s The Thing” Heroes Quest writeup at EQ2 ZAM! This year’s Heroes’ Festival is extremely special because Norrathians will be celebrating ten wonderful years of questing, raiding, tradeskilling, house decorating, and socializing in EverQuest II! Travel to the cities of Qeynos or Freeport for the joyous festivities. Be prepared to join the fun, because the Heroes’ Festival starts on Friday, November 7 and runs through Monday, November 17, 2014. It’s October and that means it’s time to get ready for Nights of the Dead! Are you ready to decorate your house, pick out a celebration costume, or take on some ghoulish foes? 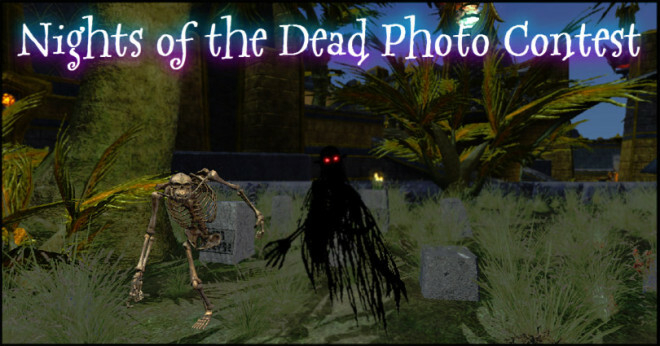 Submit an image in this month’s EverQuest II Nights of the Dead Photo Contest that shows what you are doing to celebrate Norrath’s creepiest holiday! All entries must be submitted by 4:00 PM PDT on October 31, 2014 to the contest website. Ten winners will be randomly chosen to receive 1,000 SC. We can’t wait to see what you are doing to celebrate! It’s the time of year when a chill sets in and darkness falls on the lands. Ghouls begin to emerge from the shadows and both tricks and treats are plentiful. Whether you enjoy crafting holiday items or are looking for a spooky adventure, there’s something for all Norrathians to celebrate as Nights of the Dead returns to Norrath! There are several new features for Nights of the Dead 2014, including a new Candy Crusher achievement! Adventurers can also seek out Setri Lur’eth in Nektulos Forest to take part in a new annual quest, “A Dream, By Any Other Name.” Don’t miss out on the new things holiday merchants have to sell, including house items, dungeon spawners, petamorph wands, and appearance weapons. New Bounding Orc Skeleton and Shadowy Lich costumes are also available for those who want to adventure in style! Join Team SOE and Play it Forward with Extra Life! Since September 24th, some 57 players of SOE games have contributed a whopping $3,920 for Extra Life. There’s still time to donate, and you can choose whose name you are donating for. On October 25th, Team SOE will join thousands of gamers to share the joy of gaming, be it online, board games, LARP-ing, or whatever. Together, we will raise money for the Children’s Miracle Network charity as part of Extra Life’s annual 24-hour gaming marathon. All proceeds donated will go to the local hospital of each team member! Our team is on a mission to help kids through the shared fun of gaming, and we need your help. Each of our team members has chosen their local Children’s Miracle Network Hospital where thousands of children are treated each year, regardless of their family’s ability to pay. These kids are facing scary stuff like cancer, cystic fibrosis, and injuries from accidents. On October 25th, 2014, Team SOE will be part of a huge international celebration of the social impact of gamers with Extra Life. It’s our sincere hope that you’ll find it in your heart to support us with a monthly pledge or one-time gift that will go directly to any team member’s chosen hospital. Have you been eyeballing some of those awesome status items on the city merchants? Are you running low on status upkeep for guild halls and need to restock the escrow? 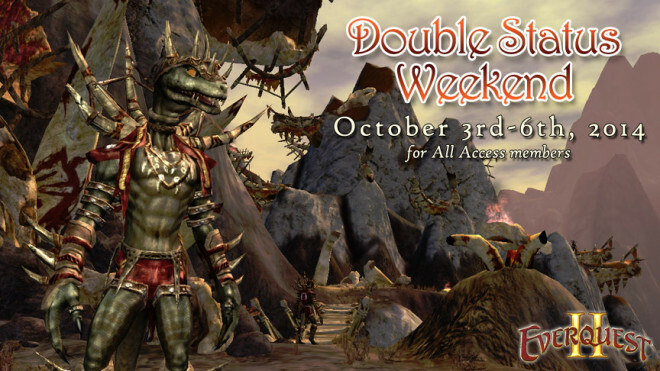 Get ready to refill your status, because it’s time for a double status weekend! All-Access Members will earn double personal status beginning tomorrow, Friday, October 3rd at 12:00pm PDT. This double status will end Monday, October 6 at 11:59pm PDT, so make sure you take advantage of it before it’s too late! We want to know what you enjoy most in Norrath. As you play this weekend, don’t forget to share screenshots of your adventures here in this forum thread! As with past Double Status weekends, this is also effectively a Double Guild XP weekend as well. 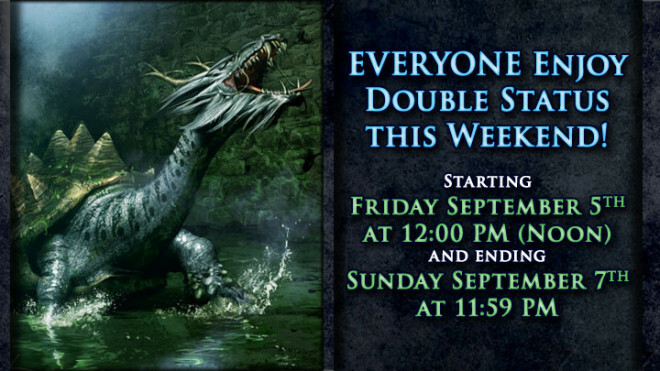 EVERYONE can enjoy double status this weekend from Friday, September 5th, 2014 at 12:00 PM Noon PDT, until Sunday, September 7th, 2014 at 11:59 PM PDT! Don’t forget to send us screenshots of your adventures on the forums, Facebook, Twitter and Google Plus! *This event doubles the base status earned by defeating encounters, or rewarded from quests. Guild status is rewarded from that base amount, so yes it is in effect doubled. A large group of you have been sending your status wishes to Tunare, and the EverQuest II Development Team has been working behind the scenes to make it happen. 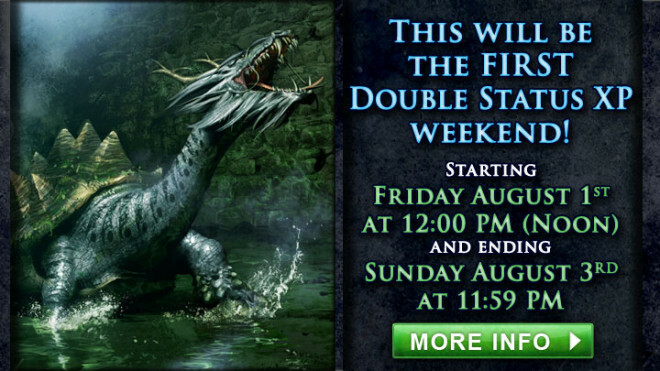 We’re happy to announce the FIRST ever double status experience weekend, starting Friday, August 1st, 2014 at 12:00 PM PDT and ending Sunday, August 3rd, 2014 at 11:59 PM PDT. Enjoy and don’t forget to send us screenshots of your adventures on the forums, Facebook, Twitter andGoogle Plus! Since you will be getting twice the normal status, and your guild always gets 10% of your status (11% if you have that LoN item), then by definition, this should be a Double Guild XP weekend. This event doubles the base status earned by defeating encounters, or rewarded from quests. Guild status is rewarded from that base amount, so yes it is in effect doubled. 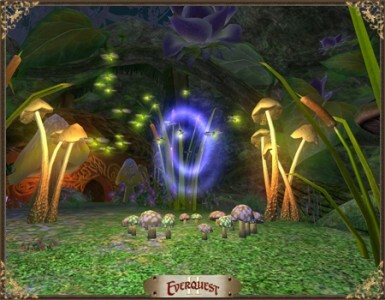 Tinkerfest goes live tomorrow and EQ2ZAM and EQ2Traders have been updated with the new crafted goodies, house items, new quest, and a totally new prestige house which have been added this year! Tinkerfest, the Norrathian celebration of all things Gnomish, starts Friday! Your EQII ZAM staff has the scoop on the awesome new additions to this player favorite. 2014 brings back all the old activities and adds more rewards, house items, and recipes! There’s a new quest and new achievement. If you didn’t do so last year, be sure to unlock your tinkered mercenaries! Tinkerfest 2014 will start July 25th and run through August 11th. Keep track of all your alts and every quest with our convenient Tinkerfest Quest Tracker! EQ2 Wikia has not yet been updated for this year’s event.